Thief demanded $30,000 worth of bitcoin to return 411Mania.com domain name. 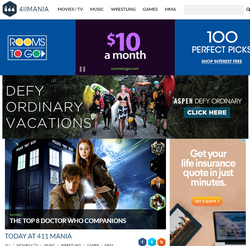 411Mania.com, a mixed martial arts, wrestling and entertainment website that gets seven million pageviews per month, was hijacked and held for ransom earlier this week. According to a lawsuit (pdf) filed in Virginia on Wednesday, the domain name was hijacked on or about April 16 and the thief demanded a ransom. On April 17, the thief demanded a payment of $30,000 worth of bitcoin for the return of the domain name. The next day, the owners received another ransom demand that included spreadsheets of 411Mania.com’s income and advertising information that the thief was able to obtain. The second notice demanded $20,000 in bitcoin and threatened to disable the website for the second time. The domain name was transferred from Register.com to Internet BS as part of the theft. Fortunately, 411Mania.com was able to get a temporary restraining order on April 19 and the domain name has been returned to its control. The company filed a lawsuit with the help of David Weslow of Wiley Rein and the restraining order was issued the same day. Weslow has helped a number of people recover stolen domain names. The post Popular website stolen and held for ransom appeared first on Domain Name Wire | Domain Name News & Views.